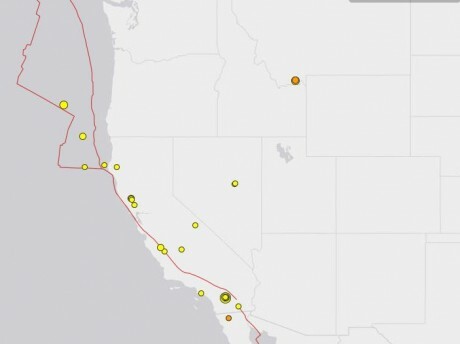 Over the past few days the mainstream media has been fixated on the largest mass shooting in U.S. history, but meanwhile there has been highly unusual seismic activity along major fault lines in California and near the Yellowstone supervolcano. Let’s talk about Yellowstone first. In recent months, the big geysers have been behaving very strangely and this is something that my wife and I covered on our television show. And now, just over the past week there have been three very significant earthquakes in the region. On June 9th, there was a magnitude 3.7 earthquake, on June 13th there was a magnitude 4.3 earthquake and earlier today there was a magnitude 4.0 earthquake. Yes, the area around Yellowstone is hit by earthquakes all the time, but most of them are extremely small. For earthquakes of this size to be striking right around Yellowstone is highly unusual and more than just a little bit alarming. A magnitude-5.2 earthquake centered in the desert northeast of San Diego caused shaking early Friday morning across Southern California. The earthquake occurred at about 1 a.m. northwest of Borrego Springs in San Diego County, according to the USGS. The earthquake was initially reported with a magnitude of 5.1 before it was revised to 5.2, according to the USGS. But that earthquake was not the end of it by any means. It is being reported that this large quake was followed by at least 800 aftershocks. Yes, we normally expect there to be aftershocks after a large quake, but to have that many is very, very unusual. The quakes that have been striking farther north off the coast of northern California and Oregon are also of great concern as well. Just recently, I wrote about the fact that the federal government has been conducting drills that have attempted to simulate the response to a magnitude 9.0 Cascadia Subduction Zone earthquake. If such an earthquake were to strike at this moment, the damage caused would be incalculable. The USGS has worryingly confirmed the same computer models show it is capable of producing an earthquake with a magnitude up to 9.3, which would likely trigger huge tsunami waves. This would be more powerful than the magnitude 9 tsunami-causing quake that hit Japan in 2011, claiming thousands of lives and taking out nuclear reactors. Worse still, many scientists say the US is not yet prepared to deal with such a natural disaster, and it could strike at an time. Scientists tell us that we are actually way overdue for such a quake and accompanying tsunami, and when it comes large numbers of Americans that are clustered right along the coastline will die. Why all of this is of greater concern now is due to the fact that many areas along the “Ring of Fire” that roughly encircles the Pacific Ocean are roaring to life right now. Eurasia’s largest volcano Klyuchevskaya Sopka in Russia’s Far East erupted shooting hot ash miles into the air on Tuesday, the local geophysical service said. “The eruption was detected [Tuesday] morning…the eruption column rose 6 kilometers [3.7 miles]. The steam-gas plume stretched for 47 kilometers to the west of the volcano,” a representative of the Russian agency told RIA Novosti. Beneath Matata, a small coastal town 125 miles from Auckland, on New Zealand’s North Island, scientists recently discovered a massive magma build-up, possibly signaling the beginnings of a new volcano. But oddly, this magma chamber is nowhere near an active volcano. According to geophysicist Ian Hamling, since 1950 an incredible influx of magma – enough to fill 80,000 Olympic-sized swimming pools – has accumulated beneath the small New Zealand town, pushing up the surface of the ground by 40 cm (16 inches). In my new book entitled “The Rapture Verdict” I talk about how Jesus prophesied that we would see a great increase in seismic activity in the last days, and that is precisely what is taking place. The crust of our planet is becoming increasingly unstable, and we have seen a series of very disturbing earthquakes and volcanic eruptions so far in 2016. Here in the United States, in recent weeks we have seen very large earthquake swarms develop under Mt. Hood, Mt Rainier and Mt. Saint Helens simultaneously. Perhaps you don’t think that this is significant, but many of the experts sure do. At some point there will be major volcanic eruptions along the west coast. At some point there will be major earthquakes along the west coast. Scientists tell us that it is just a matter of time before we see these things. Unfortunately for all of us, these things may start happening with a frequency and an intensity that none of us are expecting.